Announcing the Tzenkethi Red Alert! The Tzenkethi are not known for making idle threats. They promised that they would return with better weapons, and return, they did. The Tzenkethi Red Alert is a space-based 5 player Red Alert-style queue in the Alpha Quadrant. The Tzenkethi have found a new way to Protomatter-bomb planets and it’s up to you to stop them. 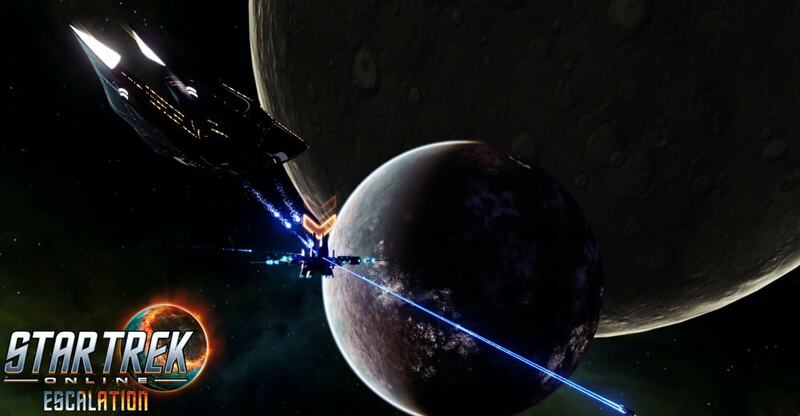 The genocidal Tzenkethi will be unleashing a new super weapon at unsuspecting planets while you and 4 allies will have to do everything you can to prevent the catastrophic destruction. If you don’t work together, the deaths of billions will be on your hands. The event is for level 50-60 players of all factions. The queue will reward marks, dilithium, and R&D materials. Check out the alert when it goes live with Season 14: Emergence, and very soon on our test server! Good luck, Captains! It’s all up to you. Captains on PC can save 20% on ships this weekend, including the brand new Buran and Qoj classes! Captains on PC can get Bonus Dilithium throughout the game this weekend!